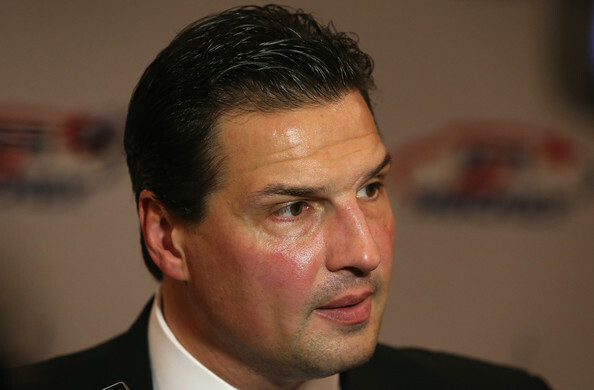 Eddie Olczyk Is Cancer Free! The Blackhawks lost 5-2 on Thursday night to the Vancouver Canucks. Nick Schmaltz and Matthew Highmore scored for Chicago. 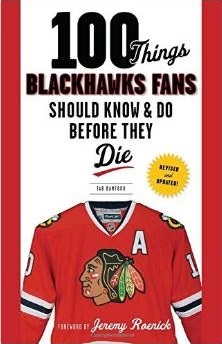 But the part of the game that every Chicago Blackhawks fan is thrilled about came between periods. On a personal note, I’ve had the chance to speak with Eddie O about a few projects, hockey and – of course – horses on a handful of occasions. He’s as genuine as anyone in sports media, no matter the sport. To hear that he’s cancer free is the best news to come out of the United Center in a long, long time. I’m really happy for Eddie. Cancer is a terrible thing I wouldn’t wish on anyone, but especially someone I’m fond of and that would include Eddie. Having said that, I hope he feels he’s now thanked everyone that he needed to thank so the broadcasting audience can move past the Eddie O cancer story. Please. He is a strong, tough, south side of Chicago guy. Glad he took it upon himself to inspire others in their fight. EbonyRaptor- I’d rather hear Olczyk’s story repeated a few more times instead of some of the posts on here! ebonyraptor — very well put. Great news for Eddie and his family! Maybe he would have the same magic as Dale Tallon? From the booth to new GM. That’s good news and for all of us Men that are over a certain age, go get a check up. And yes, indeed, everyone get your physicals, age appropriate colonoscopies, etc. Take care of yourselves! Way to go Eddie O!! That play by Hino where he stuck out his hand to stop a slapper from the point epitomizes the lack of IQ – what did he hope to achieve? – a broken finger/hand, to screen his own goalie or just to deflect into his own net – good grief – it’s the NHL boy, give your head a shake! And I can’t stand the way 56 and 82 play D. Did I mention the goalies?! Thought the same thing Wraparound about packaging Preds pick for Hamilton too. Would likely have to move a contract then to sign a FA or possibly could do it with Hossa on preseason ltir. On the flip side of that Wraparound there will be a couple of big mobile dmen available draft day who may be better than Hamilton and ready in another year if not before. Great news on Eddie O. He is such a great and honest analyst and a friend to all of us. Looking forward to continuing to learn so much about hockey from him. One thing I am not happy about is the continued joking and laughing from Pat Foley throughout the games, even when we are taking a beating. He should be mindful that this is a tough year and that watching our team struggle is no laughing matter. Should stick to his good play-by-play. Think I will turn down the sound and turn listen to John Wiedeman. One thing I am not happy about is the continued joking and laughing from Pat Foley throughout the games, even when we are taking a beating. He should be mindful that this is a tough year and watching our team struggle is no laughing matter. Should stick to his good play-by-play. Think I will turn down the sound and listen to John Wiedeman. One thing the new emphasis on speed and youth does is it pushes guys into the NHL before they would traditionally be ready, physically. That is why you saw Teauvo get manhandled a lot in Chicago and it limited his effectiveness, but with 4 years or so behind him, he has matured, and he is now more effective. Hino and Schmaltz are following a similar curve. They are in the NHL because they are fast, and have skill. Physically they will be a lot stronger in a few years. The other part that comes with experience is playing defense and playing without the puck. This is what you don’t see in the young guys just yet. Kane has come a long way, for example, in how good he is along the boards and defensively, but he is a LOT stronger now than when he entered the league. Original-I, too, am happy to hear of Eddie’s recovery. I would like nothing more than to listen to Weideman’s play by play, unfortunately it’s running 7 seconds ahead of the telecast. I guess I need to get an app or a device to the sync the two up. Watched some Detroit/Washington last night, actually heard play by play. Congrats Eddie you have been an inspiration to a lot of people. As someone who is fighting cancer myself your honest information has been so important. It’s easy at times to feel your all alone in this battle but your brave comments really give us strength. I am so happy for you and your family! As for the Hawks this season can’t be over soon enough. Get on with the rebuild and good luck Corey get better! Go Hawks and Stan have a successful off season! That’s great news from Eddie. Wraparound, you mentioned 56 and 82. Re Gus, there is a casualness about his game that irritates me beyond words. On our first PP last night, he had the puck coming out of our zone and blindly threw it backwards into open ice presumably for a late entry only probably being that there wasn’t anyone within 30 feet of it. It was like he wasn’t even watching the same game. Then, on the goal by Horvat, he blew the read and went fishing for the puck when he should have seen Horvat coming, but no, Horvat blows by him, Gus waves at him, 3-1, game over. We should have left this guy on the curb in St. Louis after he handed the Blues game 7 in 2016. Silver lining, we don’t look like we could beat anyone right now (and even if we do play well there is always the goaltending to sink us). We have a ways to go but we could get into the bottom 5. Great news on Eddie O! You can almost say Q should be fired based on that line up alone. Yikes! Or you can be like Tab and bring everyone back and expect a Kings like bounce back. Except we don’t have a young Norris Trophy defender (and they are currently hanging on to a playoff spot by one 1 and have played an extra game). How does USA goalie Jack Campbell end up in LA? Well, when you have a guy like MIKE FUTA as the Kings’s Amateur Scout, Dir. Player Personnel, and GM of a Farm team, you get a quality hockey player. Hard to understand who goalie prospects like Canadian Carter Hart and Swedish star Gustafson were overlooked in the 2nd round 2016. I saw that Rutta was a minus 3 last night so I watched all the Van goals again and he was fine – he was doing his job on each of those goals but was let down by Keith, Gus, then Hino (with the hand wave). Wraparound watching the Notre Dame regional against Mich. Tech. right now and Dennus Gilbert definitely is a physical force. A couple of occasions he has stood up at the blueline knocked the entering player down and off the puck in a way they will remember. When was last time we saw that from a Blackhawks Dman. Most important thing of this yr.
Eddie O and the Blackhawks coming back now/starting in OCT.
@ Ian – thanks for the intel on Gilbert. I’d heard from others he was an interesting prospect – here’s hoping. Didn’t realize he had been this good lately (see article link below). Happy to have Raanta come back regardless of whether Crow is able to come back. Perfect backup if Crow is good to go and stopgap or better if need to be starter for awhile. Get er done Stan. Not worried about comments he made when frustrated he wasn’t getting enough playing time. Rather have a guy overly passionate than apathetic about contributing. Nothing agasint Bread Man or anyone, I do not care id Bread Man scores 20 goals and 30 pts in 10 games when the team wins 10 in a row with some lopsided scores. He needs to be good in playoffs. Hartman had 5pts in a game, and the team didn’t win 10 in a row then, when there was some lopsided scores. Not comparing 38 to 72 but Hartman prob has as many goals and pts as Bread Man does in playoffs/at equal games played. Darls was a little better during those season and the man during the playoffs beating NAS in 15. Right now for regular season Raanta might be better. Crow is beauty is his own right. Those save Darls made to win that game against NAS wearing a back up style looking helmet. Reaching across with leg pad saves, leg pad saves on those. That was some serious buzz those saves/and that win that got us to then beating those punks from ANA and gum chewing joker TB to win the CUP. Raanta wants to be a no. 1 goalie so he probably only signs if there is no chance of Crawford returning at all, unlikely he signs a one year deal. Dylan Sikura with the Blackhawks Thursday against Jets maybe. Didn’t think that college would get past ND. ND prob should have got beat by 16 seed. Thought Notheastern was ranked 6 or 7th in country. Doesnt make any sense they were the 9 overall seed. Whatever NCAA doesn’t know how to see properly/fixed. And with that, welcome to Chicago Sikura. Sikura, high top pick, another 1st, Ejds and Jokur. That’s possible 5 good young players to go with 8, 12 and 40. Mo Michigan beat Northeastern and Quinton Hughes who may be one the dmen Blackhawks looking at with 1st pick. He has alot if skill and speed, real nice skater although i think his brother Jack who will ptovably be no.1 pick next year is even better skater. Needs to bulk up a bit, listed at 5’10” 175lbs. Blackhawks would have to believe he could be a Klingberg type player eventually who could control with skill. Wall thought Gilbert had a Jekyll and Hyde game really layed the body early and as you mentioned was beaten too easy on a few occasions but made a couple of real nice recoveries that weren’t his fault to save a couple of potential goals too. Probably not okay to say but I found it unfortunate. For his health I’m glad he didn’t die, however, he’s terrible at his job and yammers on and on and it has been worse since he’s been diagnosed as cancer-free. He is an atrocious commentator and I’m glad he didn’t die but I’m not thrilled he’s calling Hawks games and he is equally bad on NBC. He’s just bad I don’t understand the respect he gets he literally weighs down everyone around him. The guy is bad at his job. If I was as bad at my job as he is I’d have been fired several times over, in fact, I’ve been bad at my job and got fired. I hope an NHL or AHL team gives him another chance so he no longer is someone I have to listen to call hockey poorly.